We all love a good story, but just how do they come into existence and what goes into the making of a publishing house? 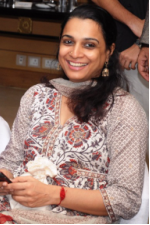 And if that daunting task isn’t enough, Sandhya Sridhar does this and more by reinventing herself in a powerful new avatar at the age of forty as the one of the managing partners of a young and thriving publishing house Page Turn Publishers. Clad in a comfortable salwar kameez and wearing traditional jhumka earrings, this wonderfully modest, friendly and frank person shares her inspiring story. Once upon a time, a couple of decades ago, there was a dream. It began on the pavements of Mount Road in Chennai, now rechristened Anna Salai. I would, in between college schedules, wander up and down that particular broad thoroughfare that was not so congested as it is now. These book vendors were like a modern Ali Baba’s cave for books. Not only would I find a rare Thomas Hardy or an 1890 edition of a Dickens, but I would also find what I would call the Rs.2 novel – the humble Mills & Boon, that wonderful escapist little book within which young girls of the pre-television era discovered a different world. My peers and I not just travelled the world thanks to these bits of romantic stories(the plots could be set in exotic destinations that were described to the last detail), but we discovered a new ideal man – the TDH or the Tall, Dark and Handsome hero. Of course, the fact that we hardly sighted this particular creature in its described perfection back home, but that did not deter us from conjuring him from the pages of the romance. Even then I wondered, why is it that such contemporary fiction catering to the English reading segment did not exist back home. I do know there were a couple of brave souls who attempted this in another format much later, but the romantic fiction genre in Indian English in the accepted world format remained virgin territory. Then came the job. Post the final exam or the final college year, I meandered into editing a children’s magazine in English. The best thing that happened to me then is the training I received under my ‘guru’, the chirpy and indefatigable Kamala Chandrakant, who made me re-write, cut, chop and reformat in longhand, again and again. I never forgot what I learnt under her. She was tough and uncompromising, and I am grateful to her for being so. Then came the job. And then the job. It took over my life, every breathing moment. The dream was forgotten. And then one day, 15 years of employment later, it was like someone flipped a switch. I knew that it was time to leave the job behind – but was it time to pursue the dream? But unfortunately the job meant an income, it meant a contribution to everyday life, and it was not a decision that could be taken easily. Yet, it was done, but then someone else came by and offered me another job. Faint-hearted, I turned chicken and took the job. This happened not once, but twice. Entrepreneurship is not for the faint-hearted and at that point I fell firmly in that category. The vision of being ‘unemployed’, sans income, struggling to establish failed to enthuse when push came to shove. Then someone flipped the switch again, and this time, the bulb came on. It was time to be on my own, be myself, and work on my own terms. The work arena was changing, less challenging and yes, it did not need me. It took some time for me to come to terms with the latter fact and once that happened, I stepped off the carousel and discovered that yes, it could continue to go round and round without me. No one, as the boss would say, is indispensable. I began the ground work. Checked out what it takes to create a book. Asked around for manuscripts. Discovered there were closet writers who wrote romance for pleasure, and who were thrilled that they could see their books in print in this genre. Registered Pageturn Publisher Pvt. Ltd. that would publish the Red Romances and the other imprints that we planned to bring out. At this point, we were three in the company and three was company, for we had split our responsibilities. I would do the manuscripts, production/the second partner would do PR and marketing/ the third would take care of design and production aspects along with me as well. I also met potential distributors – who looked at me in amusement and said that they would be unable to take on another publisher – there was no room in their warehouse! Met potential printers and took competitive quotes. Two people who mentored us through this gestation period became our sounding boards at different times. Hemu Ramaih and Gautam Padmanabhan of Westland. We made dummy books. Experimented with covers, fresh layouts. It was an exciting time, but one that was uncertain. Like earnest babies taking first steps, we ventured wide-eyed, and then one day, our first two books were out in the market. Together 24 x 7 by Sunita Suresh and Dewdrops at Dawn by Sahana Sankaran. It was a thrill indeed and suddenly, there were readers getting in touch with us thanks to the mail id we had published in the flyleaf. Some said that they liked the books. When were the next coming out? Others said they had manuscripts in the genre, could we take a look at them? My partners and I spoke of our venture to everyone we knew – and soon, manuscripts began to trickle in. I aspired to bring out two titles every month. I struggled to put in place two every quarter. Obviously, we could dream, but the realities of the waking world brought in new challenges each time. Since we were, and continue to be on a shoe-string budget, we continued to wear different hats – delivery boys, editors, errand boys, event managers. It was great fun, but yes, the fact that we were sinking in monies into the venture was a hard reality. We had to make it work. My partner and I ventured to newer markets up North and West. We discovered that book distribution was a man’s world in some sense. But we discovered plenty of good people who gave us pointers, who helped us join the dots and move on, trying something new when something failed. At one place I was told, “Why don’t you ask your husband to do your marketing?” I tried to imagine how convincing my spouse would look peddling romance – and failed. I laughed instead and told him that he would have to do with me. And then in August 2011, my marketing partner and I parted ways. It was a decisive time for me. I ambitiously attempted to juggle editing and production along with marketing and PR and failed miserably. I was forever chasing deadlines. Not delivering what I was promising. It was frustrating, especially since I felt foolish for the promises I was making. I roped in close friends who were also my associates from my previous media job, who were game to take on some of the onus of the editing. Soon, there was some method to the madness. Editing cycles were getting manageable, but still there was a backlog. I didn’t have to look too far. The backlog was thanks to me. There I was, running around meeting people, trying to get more copies into the market, meeting more people and learning the trade. And there I was, a stumbling block in the editorial cycle, where all manuscripts met with their waterloo. I had no time to give them the reading they deserved. Yet, I wanted to be there, touch and feel every book, from the first word to the last. I was a control freak. My editors and I discussed the process. Everyone was unanimous that I should either give the manuscripts time or should let go. I was of the same thought as well. But thinking and doing are different things and I continued to be in the process till last month. As the marketing whirl began to spiral, I kept letting go, inch by inch, until all I had left with me was the pre-press. The reality check helped. It put the production cycle back in action, and yes, we could bring out four books every two months. Provided I didn’t block the cycle by sitting on a manuscript. Not having deep pockets is a disadvantage – for you are unable to explore the scope of a full marketing potential. But on the flip side, it also helps you make do with the little you have. It is like being eco-friendly. When you didn’t have plastic, you did the correct thing by using the banana leaf. I think being careful with the monies also helps you prioritise what is important only, and let go of the rest. Grappling with not just payments, but receivables, account ledgers and most important, stock numbers, is not easy. It meant that I had lots to do and little time. I continue to manage these myself and yes, the marketing as well. I am conscious that working in different markets could be difficult. People tell me that I should employ someone to do this. Someone preferably male. But as a newbie in this trade, I want to know ground realities, learn them and work with them. I fully appreciate the advantages of knowing every aspect of your chosen field, for then, no one can take you for a ride. I was crawling, now I am walking and tomorrow, I want to run. All this would be impossible without the many good people from the publishing and distribution industry that I meet every day, speak to every day. They are my mainstay, my new family. I may be a strange new creature, in an exalted trade, peddling the littlest of literature. Yet I know, that Red Romances, by introducing the love story in its girl-next-door avatar has crossed the barrier – the genre is virgin no more in India. And we have made inroads.